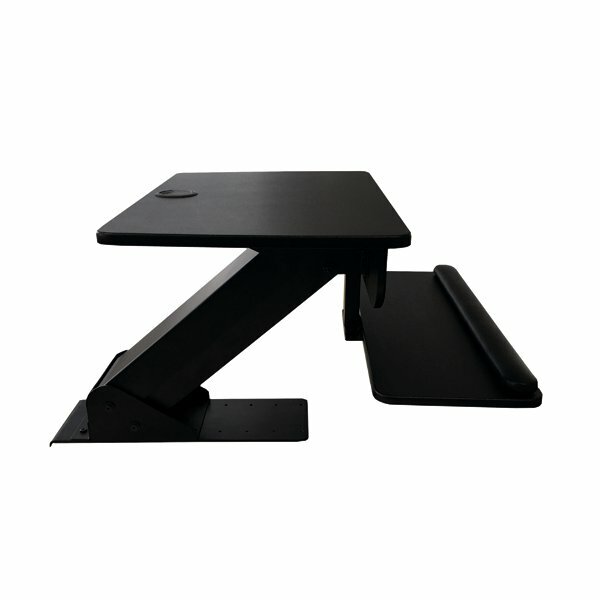 Designed for use with desktop PCs or laptops, this Contour Ergonomics sit stand workstation comprises a desk clamp, monitor/laptop platform and keyboard tray, and allows the user to work in either a seated or standing position to help alleviate the health risks of sitting for long periods of time, which includes heart disease. The durable steel workstation features a very robust, stable design for working and has a unique braking lever system to effortlessly move from sitting to standing position in just a few seconds, with a height adjustment of 126mm to 555mm above the desk. The workstation clamps firmly to the desk and is adjustable backwards and forwards to help locate the optimum position with the edge of the keyboard tray flush with the edge of the desk. The keyboard tray itself features an integrated wrist rest for increased comfort whilst working. The top platform measures 600 x 400mm, the keyboard tray measures 600 x 221mm, and the total load capacity is 13kg.